Like most people, my creativity and enthusiasm for cooking seems to droop on busy weeknights. I was recently flipping through the latest issue of Health magazine and they were featuring several recipes from Giada de Laurentiis‘ new cookbook, Weeknights with Giada. 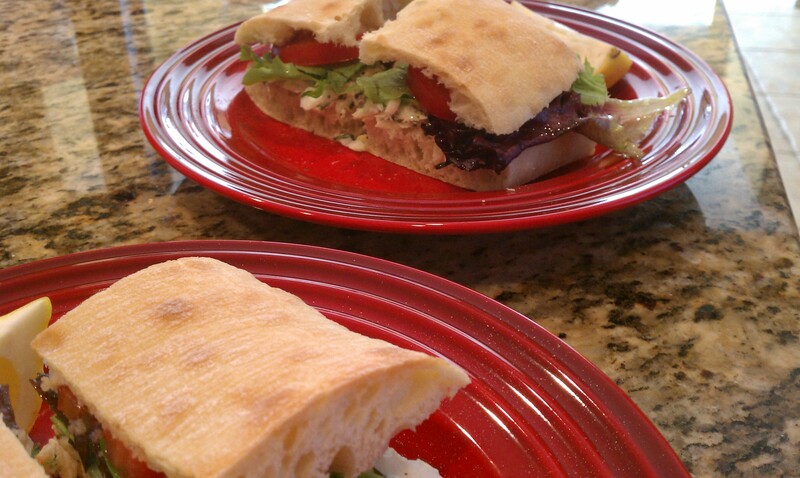 I have to admit, they all looked pretty do-able, and the Mediterranean Halibut Sandwich recipe was calling my name. I am all too familiar with making basic sandwiches for a quick dinner, but this halibut recipe is restaurant-calibre, in my humble opinion. The fresh herbs and lemon zest mixed with the halibut really make the dish special. I didn’t deviate much from the original recipe, other than to use fresh sliced tomatoes in the sandwich instead of adding sun-dried tomatoes into the halibut-mayo mixture — just to keep from throwing the kids off too much. I also left out the capers. The sandwiches were a big hit, and I will definitely be making them again. I may also try using the halibut-mayo mixture in a pasta salad. Preheat oven to 450 F. Spray a small baking dish with cooking spray; add halibut and season with salt and pepper; rub with 1 tsp oil. Bake 10-15 minutes, until cooked through and the flesh flakes easily with a fork. Cool. Remove some bread from the top half of loaf (and try not to eat it all). Brush cut sides with 2 tbsp oil. Bake on a baking sheet 6-8 minutes, until golden. Rub toasted surfaces with garlic. In a medium bowl, combine mayo, sun-dried tomatoes, basil, parsley, capers, and lemon zest. Add fish, flaking and mixing with a fork. (I added extra salt and pepper at this point). Spoon onto bottom half of bread and top with arugula (I tossed my greens in a bit of olive oil). Add top of bread and cut into 4 sandwiches.